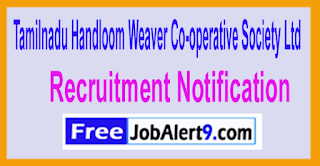 COOPTEX (Tamilnadu Handloom Weaver Co-operative Society Ltd) Has Released Recruitment Notification For 10 Assistant Salesman or Saleswoman Posts. All Eligible & Interested Candidates Can Apply Offline.Further Detailed Information Regarding Educational Qualifications, Age Limit, Selection Procedure, Exam Pattern, Syllabus for COOPTEX (Tamilnadu Handloom Weaver Co-operative Society Ltd) Recruitment 2017 - 10 Assistant Salesman / Saleswoman Post is mentioned below. Candidates age should be between 18 to 28 Years. Rs. 4140 - 10,000/- . All Eligible & Interested candidates Can Download application Form through official web-site (http://cooptex.gov.in). After Filling The application form, candidate must send by hard copies of application a long with relevant testimonials (Mentioned In Detailed Advertisement) to the following Address before / (12th June 2017). The Regional Manager, Co-optex Regional Office (TNHWCS Ltd.,) No.201-A,Dr.Alagesan Road, Saibaba Mission Post, Coimbatore, Pin code-641 011 . Closing Date to Submit the Application Form - 12-06-2017. COOPTEX Tamilnadu Handloom Weaver Co-operative Society Ltd Recruitment Notification 2017 The Post of 08 Assistant Salesman Post Last Date 31-05-2017 COOPTEX (Tamilnadu Handloom Weaver Co-operative Society Ltd) Has Released Recruitment Notification For 08 Assistant Salesman Posts. All Eligible & Interested Candidates Can Apply Off-line. Further Detailed Information Regarding Educational Qualifications, Age Limit, Selection Procedure, Exam Pattern, Syllabus for COOPTEX (Tamilnadu Handloom Weaver Co-operative Society Ltd) Recruitment 2017 - 08 Assistant Salesman Post is mentioned below. Age Limit - Candidates age should be between 18 to 28 -Years. Pay Scale - Rs. 4140 - 10,000/- . How To Apply - All Eligible & Interested candidates Can Download application Form through official web-site (http://cooptex.gov.in). After Filling The application form, candidate must send by hard copies of application a long with relevant testimonials (Mentioned In Detailed Advertisement) to the following Address before/ (31st May 2017). Address -The Regional Manager, Co-optex Regional Office (TNHWCS Ltd), No.204, UDYOG MANDIR No.2, 7 – C, PITAMBER LANE, MAHIM (WEST), MUMBAI, Pin code – 400 016 . Click Here For COOPTEX Recruitment 2017 Detailed Advertisement & Application Form.